Long ago the people did not know how to cultivate maize (corn) and had to rely entirely upon hunting and gathering to obtain food. In the old times the people were very virtuous and spent much time fasting. Because of their fasting, the Hočągara were very powerful and were able to meet their needs. Nevertheless, it was very difficult for them. Once a clan of the Hočągara fell into want and it became necessary to fast so that the spirits would take pity upon them. However, the chief of the clan said that he would fast for all of his people. So great was his fast that he nearly fasted to death. Then one time during his fast he dreamt. The Spirit of the Maize took pity on the chief and appeared before him to give him a blessing. She told him where to find the maize and what he should do to have it in abundance. She showed him how to make a small mound, push a stick into it, and place the corn into the hole. She told him how to care for the maize, and how to tell when it was time to harvest the ripened ears. She showed him how to preserve the corn so that the people could eat it all year long. Commentary. 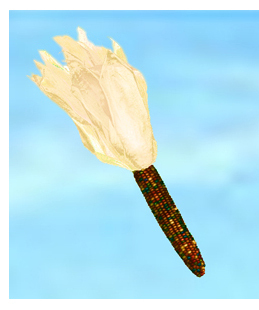 "maize" — today, the maize of the Indians is flint corn, which is polychrome, the kernels coming in yellow, white, red, purple, orange, and black. It is used today mainly for decoration, having been superceded by purely yellow corn. However, in the past, they also had many forms of uniform color: yellow, white, and red, most particularly. 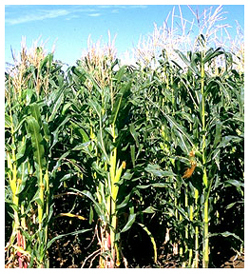 Stories: about maize (corn): Maize Origin Myth, The Medicine Rite Foundation Myth, The Green Man, Grandmother's Gifts, Waterspirits Keep the Corn Fields Wet. Themes: a person who fasts receives blessings from the spirits: The Blessings of the Buffalo Spirits, The Boy who was Blessed by a Mountain Lion, The Nightspirits Bless Jobenągiwįxka, Ghost Dance Origin Myth I, Redhorn's Sons, The Boy Who Became a Robin, The Woman Who Fought the Bear, The Seer, The Warbundle of the Eight Generations, The Woman who Loved Her Half-Brother, The Boy who would be Immortal, The Thunderbird, Lake Wąkšikhomįgra (Mendota): the Origin of Its Name, The Waterspirit Guardian of the Intaglio Mound, Great Walker's Medicine, Šųgepaga, Earthmaker Blesses Wagíšega (Wešgíšega), The Man Who Would Dream of Mą’ųna, Heną́ga and Star Girl, A Man's Revenge, Aračgéga's Blessings, The Blessing of a Bear Clansman, The Man who was Blessed by the Sun, The Girl who Refused a Blessing from the Wood Spirits, Buffalo Dance Origin Myth, The Man who Defied Disease Giver, White Thunder's Warpath, A Man and His Three Dogs, The Oak Tree and the Man Who was Blessed by the Heroka, A Waterspirit Blesses Mąnį́xete’ų́ga, The Meteor Spirit and the Origin of Wampum, The Diving Contest, The Plant Blessing of Earth, Holy Song, The Tap the Head Medicine, The Blessing of Šokeboka, The Completion Song Origin, Paint Medicine Origin Myth, The Nightspirits Bless Čiwoit’éhiga, Sunset Point, Song to Earthmaker, First Contact (v. 1), The Horse Spirit of Eagle Heights; the spirits bless a fasting man with a special plant: The Plant Blessing of Earth, The Blessings of the Buffalo Spirits, Great Walker's Medicine. 1 Sally M. Hunter, Four Seasons of Corn: A Winnebago Tradition (Minneapolis: Lerner Publicatons Company, 1997) 16-17.